Those hours that you were just considering cherishing forever? Yeah, those are gone and here you are writing a blog post to cherish them already. All that laughter and conversation. All that gladness. That warm and fuzzy feeling of comfort. Of satisfaction. Who knows when’s going to be the next time you can all sit together? If, in fact, you can, at all? Such is the sadness of life. Even in the gladness. The cold feeling of this-will-be-over-soon amidst the warmth. The satisfaction is just an illusion. A mirage that only provides virtual, temporary comfort. And the memories? Pretty soon, those are going to fade away too. One minute you’re in a room-terrace-platform looking at the grey sky. The next, you walk out and meet a little boy coming up the stairs. He is younger than you remember. Or maybe not. You don’t know his face. Yet, you do know him. You tell him not to go up there. He is not supposed to go there. He doesn’t really listen to you. But you insist. You’re outside and standing with him. You recognize this place too. You’ve been here so many times before. And with this recognition comes another: you’re dreaming. You haven’t pinched yourself. Nor do you think about pinching yourself; you’re that sure. Also , you don’t want to wake up. And you’re sure because you’ve been here before. So many times. But back then, last time you were here, this was part of another dream. All the familiar landmarks are there. The dark green grass. That smell. Those lavatories in the background. The almost-hidden staircase leading to those well-known rooms. Those brick walls. It’s all how it used to be. It’s not at all how it used to be. You’re actually lying on your bed. Not quite but almost flat on your stomach. Mouth hanging open but no wet cold sticky feeling against your cheek. White powdery dryness at the corner of your lips. One arm is tucked under you, dead; the other ignored. You’re standing in that garden like place, trying to place that smell. But now you can’t see those lavatories or those rooms. You wonder where that boy you know so well went. That other building is back. You stand there remembering all of it. All of it. Every place, every face, every itch, every scar…every nano-second. The rainbow intersects the dark cloud and your pot of gold is the only consolation is that nothing can hurt you at this moment. You’re as safe as you can possibly be. This is why you don’t want to wake up even though a tiny part of your brain is trying to tell you it won’t work. The other part stuffs the tiny one into the trunk you keep for these purposes and walk on to see what is next up in line for you to remember. Whatever it is. And sometimes, the only thing you have to hold on to. You know I don’t really blame you. I get it that it’s not your fault. I mean, I just have one of those faces, you know? You do know, don’t you? I’m talking about those very special ones. You know…the ones which can be forgotten or dismissed. But of course, it is not your fault. I have the kind of a face no one remembers and then, doesn’t remember the not remembering. And then, my face doesn’t let you remember the not remembering of the not remembering. And then, obviously, how can I expect you to remember the not remembering of the not remembering of the not remembering? I don’t. On the other hand, I remember. Lots of things. People. Faces. Conversations. Promises. Numbers. In fact, I remember so many things that happened so long ago that I could easily be an elephant. It’s simple. Elephants can remember. I can remember. Therefore, elephant = I. See! That’s how I’m such a Math genius. It’s a separate matter altogether how I don’t move around in a herd, though. Nope, no herd; a lone wolf-pack, in fact. I don’t think elephants and wolves can survive together…can they? I think it was only mammoths and saber-tooths (and sloths of course) who could be friends. That’s probably why they’re extinct now. Not the sloth though. It’s just too lazy to do anything, I presume. So maybe I’m going the same way too. Thanks to the remembering and the not remembering. (FIY, I’m not talking about the sloth; have already perfected that). Probably for the better though. My face can’t obviously survive the competition or face evolution. I have to face the way of the dodo. You don’t have to be worried or anything though. You see, you won’t remember. Everyone wins. I stood against the window, silently staring into the desolate and dreary outdoors. The glass pane quivered and the wind whistled in from the cracks under the door. Outside, the rain poured down into the hot summer evening. The sun had not set yet but had vanished behind the cover of the dark grey clouds that filled the entire sky, lit up occasionally by a bolt of lightning. They did not look as if they would let up any time soon. And the rain. It wasn’t simply pouring, it pounded down heavily. It pounded on the houses, the roofs, the driveways, the cars, the pavements, the yards, the vegetation; everything was deluged from the downpour. The trees shook swayed around as gusts of wind hit them and plant beds had become ponds with flowers. The gloom created by the rain was intense. Not a soul could be seen anywhere. A handful of cars whizzed by but they were only blurs in the rain. Even the stray cats and dogs did not come out to bathe in the rain, as they usually did in the summer. Ghost town, I thought to myself, at the lack of the evidence of any living being, and then laughed at my own silliness. Ghost town, indeed. I knew for a fact that everyone of the houses around my own house was occupied and at least one person was home. But the laugh was hollow and bare of any genuine feeling. And I could feel the gloom seeping in from the cracks under the door. It crept in like a poisonous gas, edging in slowly and silently, unseen, unheard. It swirled around the perimeter of the entire room and engulfed everything within. It seeped into the sofas and the cushions and the stools and the tables and the ornaments and the hanging pictures and the old wooden desk in the corner and the old oak chair behind it and the papers on the desk and the books in their shelves and the big, dirty chandelier in the middle of the room and the floor and the ceiling and the walls and even into the small fire. The room started to feel colder than before, as if all the warmth and cheerfulness had been sucked out of the room. The fire actually began to flicker and die down in the grate and it took several pokes on my part to stop it from dying out completely. With a huge sigh, I settled myself in the one-seater sofa, with a magazine, with a view of the outside. With my feet relaxing on a stool, I stared out of the window. The gloom had gotten to me as well. The anguish and sorrow in my heart were already unbearable. Now, with the rain still pattering away all around me, my pain seemed to be alleviated a hundred times than before. In a moment of utter despair, I threw the magazine in my hand, as hard as I could, at the window. It struck the glass with a dull thud and then slid down the wall on the floor beside the stool in a flurry of glossy coloured pages. My eyes filled with tears and sobs racked my body as I silently began to lament my loss. And looking out of the window, at the everlasting rain, I felt as if the skies were also mourning. I felt as if they had wanted to tell me that I wasn’t the only one in pain. They had tried to console me but the grief been too much. And so, they couldn’t help but weep for my loss. But suddenly I realised that something was different. The skies were expressing their grief over my loss but they weren’t entirely silent. And at this thought, I couldn’t help but smile wanly through my tears. And then, it was everywhere. The moment I stopped crying, I could hear it clearly. It was the most wonderful thing I had heard in a long time. Shunting aside all sorrow and fear and inhibitions that I generally had, I ran out of the room and into the corridor and opened the front door. Slightly hesitant, I took off my shoes, threw them back into the house and gingerly stepped into the rain. I was immediately drenched. Dripping and still being soaked, I crossed my driveway and walked into my lush front yard. The soft and slippery grass tickled my shoe-less feet. I turned my face towards the heaven and felt the rain drops sliding down my face. They felt cold and soothing on my hot, flushed skin. And standing there, face upwards, arms open, feet bare and soaked completely, I could hear it loud and clear. 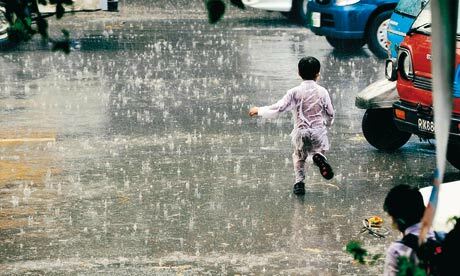 The Music of Rain was present in each and every drop that fell from the majestic sky to the thirsty ground. At first, it seemed to be mourning, just like me. A sad little drizzle. Speaking of nothing but utter misery. Feeling only sorrow, sharing my pain. But slowly, it dawned on me. The Music of Rain wasn’t a melancholic song I was hearing in my mind. Yet it was just that. It didn’t have a happy vibe and yet it did. It was both things at once. It was sorrow and it was joy; it was happiness and it was sadness; it was pleasure and it was pain; it was contentment and it was frustration. It was different and conflicting and yet, it was the same and compatible. I finally realized that life is a delicate balance of the happy and the sad, the good and the bad. I had allowed myself to drown in my own sorrow, whereas life had a fair share of both for everyone. Even me. Only, I had to give life a fair chance, to prove itself. Sure, you’ll have your share of misfortunes and complications, the Music of Rain assured me, but you have to remember the silver lining. Feeling better than in a long time, I opened my eyes. The sky was still filled with grey clouds and the rain was pouring. The mud under my feet smelled sweet and wet. The trees and bushes and the grass seemed cleansed of all the grime of the past. The air was lined with the sweet scent of a multitude of flowers. The chirping of a few birds, bathing in the rain filled the distant air. And I…I, too, felt cleansed of all troubles and sorrows of the past. Felt like a totally new person. Smiling, I shook my head at my earlier thoughts, my past self, and walked back up the drive into my warm and inviting house. Before I closed the door, I stood for a moment and listened for it. Yes, it was still there. The Music of Rain was still there. And in a sudden moment of clarity, I knew it had always been there, and would always be still there. You just had to listen for it. I guess I just need to always remember this.